Continuous operations routes are given top priority. Continuous operations are the plowing and application of snow and ice control treatments on an as needed basis for a designated route, throughout the storm until all lanes are restored to a near normal condition. A district continuous operations system shall include all major highways, minor highways with traffic volumes of 2,500 AADT or greater and other urban and community routes designated by the district in consultation with the Maintenance Division. Continuity of route treatments as well as coordination with adjoining districts (regardless of AADT) shall be addressed between the districts. Snow and ice control shall follow these guidelines and objectives for determining route priorities, during winter events. Continuous Operations Routes: These routes include all major highways, minor highways with 2,500 AADT or greater traffic volumes and other urban and community routes designated by the district in consultation with the Maintenance Division. This also includes all designated incident bypass routes. The objective is to have all lanes on these routes restored to a near normal condition as soon as practical after the end of the storm. To achieve this objective, plowing and/or application of snow and ice control treatments on an as needed basis on these designated routes, 24 hours per day throughout the storm, will be necessary. 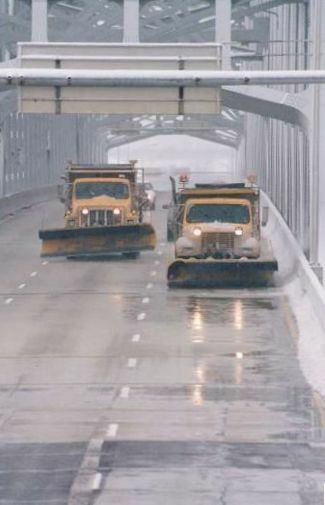 Interstates and other higher AADT routes will be plowed and treated first. The use of anti-icing methods is appropriate for continuous operations routes. 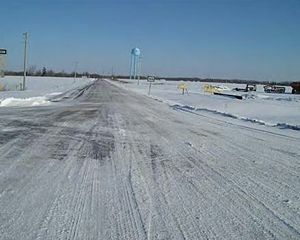 Continuous Operations Route Paved Shoulders: Removing snow and ice from major route paved shoulders should be performed in conjunction with plowing of the traveled lanes, especially the high sides of superelevated curves, if drifting is occurring, if weather predictions are unfavorable or to reduce ramping situations. The objective is to have paved shoulders for continuous operations routes plowed during, or shortly after, the storm. 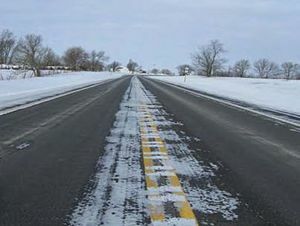 Do not treat paved shoulders directly with anti-icing or de-icing chemicals. 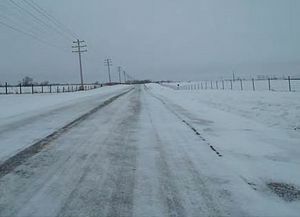 It is acceptable for paved shoulders on continuous operations routes to remain covered or partially covered when snow and ice operations are suspended. It is not necessary to return paved shoulders to a near normal condition. 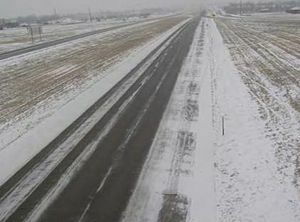 Paved shoulders next to extended or continuous traffic barriers, bridge parapets, impact attenuators, guardrails, curbs, narrow medians and gore areas should be given special consideration where snow accumulates and has the potential to form ramps. Non-Continuous Operations Routes: All other state highways not included in the Continuous Operations Routes. The objective is to have these routes open to two-way traffic and treated with salt and/or abrasives on hills, curves, intersections and other areas as needed. It is allowable for these routes to be plowed and the surface remain partly covered or covered when snow and ice operations are suspended. 24-hour per day coverage may be appropriate until the objective has been met. These routes should be prioritized by traffic volume. Reasonable efforts will be made to ensure that all roads have received some level of attention prior to morning and evening rush hours. Plowing: Plowing operations should not begin until there is enough accumulation to warrant this effort. After the storm is over, plowing should cease once the loose accumulation is removed on minor routes and the continuous operations routes are in a near normal condition. On minor routes, plowing will begin as soon as snow equipment becomes available from higher priority routes. Sight distance: Sight distance locations such as at intersections and interchanges should be cleared of any obstructions caused by snow piles or accumulations. Duration of Operations: Snow and ice removal operations shall remain in effect on a 24-hour per day basis until the above-mentioned objectives are met and sustained for both major and minor routes, so long as an acceptable level of progress can be achieved. Post-storm clean up: Post-storm clean up during normal working hours includes continued plowing and treating of minor routes, bridge flushing and sweeping, equipment cleaning and maintenance, and salt storage housekeeping. The use of overtime for these activities is at the discretion of the district engineer. Reasons for policy: To ensure the routes with the most traffic are cleared first and provide uniform statewide snow removal practices. MoDOT shall repair or replace, as required, those mailboxes and posts that have been damaged due to snow and ice removal operations. Replacement mailboxes shall comply with Post Office standards. Questionable situations should be referred to risk management. Reasons for policy: To establish a procedure for dealing with these situations, ensure each situation is handled in the same manner and ensure continuous mail service. 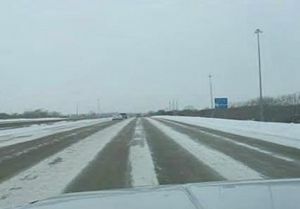 MoDOT does not assume responsibility for the removal or clearance of snow, ice or sleet, or the opening of windrows of such material, on any sidewalk or entrance along any state highway even though snow, ice or sleet, is deposited or windrowed on these sidewalks or entrances by department personnel. Maintenance and urban agreements with municipalities, in most cases, call only for the plowing of snow from the traveled portions of the street or roadway and there is no obligation to plow parking lanes or to remove the snow deposited from plowing the traveled way. In the event of life threatening emergencies, MoDOT will respond to a request from an official or medical entity such as State Highway Patrol, police, sheriff, paramedical, ambulance service, doctor or fire department to open a non-MoDOT system road closed by snow. Other catastrophic events will require authorization by the district engineer. Lights - Lights and snow plow reflectors shall be checked repeatedly to ensure they are in good condition, operating properly and visible to all traffic. Operators shall clean all lights periodically during storms. Stopping on Roadways - Equipment should not be stopped on the roadway surface to engage spreaders, or talk to another operator. Equipment should be pulled off the roadway to a safe spot to perform these tasks. Slow Moving Equipment - Slow moving equipment shall stop occasionally at safe turn out locations to allow traffic to pass. Flaggers and Signing - Flaggers and appropriate signing shall be used during post storm operations when shifting snow, cleaning bridge decks, loading snow or any operation which interferes with the normal flow of traffic. Bridges - Operators shall avoid pushing snow over bridge railings onto roads or railroads. 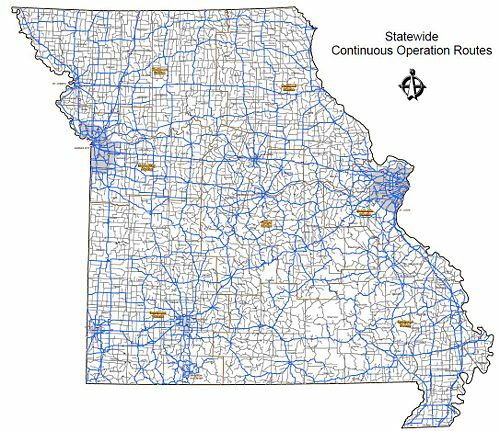 A statewide winter road condition report shall be made available to update the traveler information map on MoDOT’s internet web site. 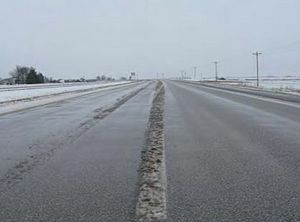 Every year between November 1 and March 30, districts shall update the winter road condition report at the beginning of each workday, even if there is not a winter storm. Conditions will be reported as clear, mostly clear, partly covered, covered and closed. 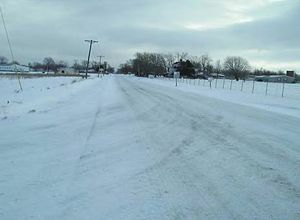 During winter weather, even if the storm falls outside of November 1 to March 30, districts shall report changes in road conditions as they occur, or at least every four hours throughout the winter event. Customers will rely on the information they find on the traveler information map, therefore we encourage districts to do updates more often on nights and weekends when roads are icy, snow covered or wet, and freezing may occur. After a storm ends, districts shall continue to report all changes in road conditions a minimum of every four hours until all continuous operations routes have returned to mostly clear conditions. The districts are still expected to update the Traveler Information Map when conditions change from mostly clear to clear, but they may wait until normal working hours to make this change. No overtime will be required to make this change. Districts that are unaffected by a winter storm only need to update information once per workday. The Traveler Information Map, that shows the winter road conditions to the public on the external web site, will show “Clear, Mostly Clear, Partly Covered, Covered and Closed”. Reason for policy: To ensure that the statewide report is correct and up to date, all districts must keep the reporting data current and accurate. 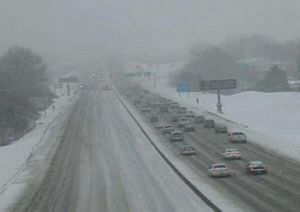 Non-Continuous Operations Classification Example - "Suspend Operations"
During a snow and/or ice storm situation, MoDOT, with district office approval, may immediately remove any abandoned vehicle if it is creating a traffic hazard because of its position in relation to the state highway. Preferably the Missouri State Highway Patrol will take the lead roll in these situations. A statewide Winter Event Report Database shall be made available for use by MoDOT Maintenance managers. This database shall be used to report and track information about winter events. Use this database to create a report whenever there are material and/or equipment usage charges related to falling precipitation events such as snow, sleet or freezing rain or non-precipitation events such as frost, black ice or refreeze of melted snow. This includes routine anti-icing efforts prior to an event or for frost control on bridge decks. No report is necessary if you do not have material and/or equipment usage charges. This page was last modified on 6 December 2018, at 14:16.